We want this to be easy on all of us. Even though UChicago Voices is designed to be easy, we know there will be questions. This Getting Started guide that will get you up and running with a site in a few minutes. Each section below shows you how to get moving fast. The site address must be at least 4 characters and can only contain letters and numbers (no spaces or special characters). Once created, it cannot be changed. You can choose if you would like your site to appear in search engines, and in public listings around this network. This can be changed at any time. After completing the form successfully, a new page with “Congrats” is presented. Click on site URL to see your site. If your site is not created, it is likely because there is an issue with the URL you are trying to create. An error message will appear below the field that needs to be corrected. Now that you’re on your site, you will see both the default design of your site, and the admin toolbar along the top. There will be plenty of opportunity to customize the look and feel of your site, but it’s a good idea at this point to click through and see some of its features. Your site is managed through a “Dashboard.” The Dashboard is the control center of your site. You can manage everything about your site from the Dashboard. Only you see your Dashboard and it can only be accessed when you are logged in. To visit your dashboard, hover over “My Sites” on the toolbar at the top of your site. It will provide a drop down menu where you will access your Dashboard. Blog posts are typically shorter, topical entries. Posts are often featured on the homepage of your site, and can be written regularly. To add a new post: Posts > Add New. This will take you to a page to create a post. You should select a title, add content in the post field using the rich text editor, add a category and/or tags, and publish. 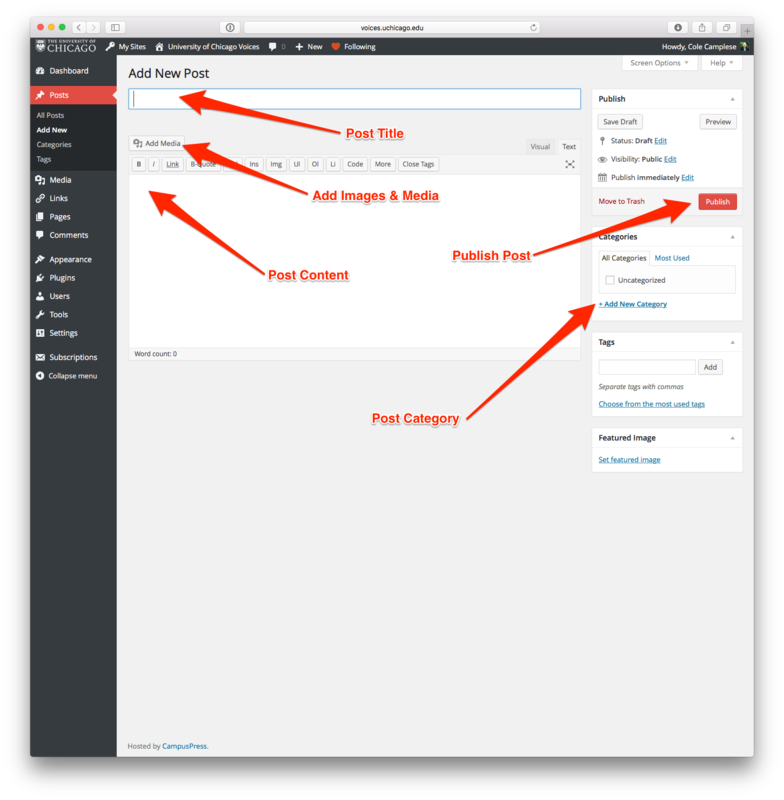 Once on the “Add New Post” page, it is easy to add a title, the content of a post, create or select a category, and publish an entry. Once you have published your post, it is easy to both view and edit the content of the entry. One of the many features of a blog is the ability categorize your posts based on the concepts of “Categories and Tags.” We feel strongly that posts should at least be placed in a Category for help in organizing and finding content over the long term. Categories are broad groupings of post types. For example, if you wrote a food blog, your categories might include “breakfast” and “dessert.” Tags are more specific to the content of the post, so if you wrote a recipe for chocolate cake, you might categorize it in “dessert” and tag it “cake” and “chocolate.” Categories are useful on your blog when readers visit and want to view several posts that are similar. Tags are useful to find specific posts and for searching on the SB You network. There are a lot of ways customize the look and feel of your site, starting with the theme. The theme is the design of your site. We will only cover a few quick ways to customize your site, but there are a lot of support materials available should you want to customize further. Select a Theme. On left menu, click Appearance > Themes. The default theme, Twenty Twelve, is highly recommended for its ease of use and simple design. Activate your chosen theme (if not Twenty Twelve). Change Title and Tagline. Once selected, you can hit “Customize” to change the site Title and Tagline (title shows up in the browser tab, tagline shows as a subtitle in some themes). Change the banner image. From the customize menu, you can change the banner image at the top of the site under “Header Image.” You can select a different default image, or upload an image of your own. You can also customize the Header text color, the Header image, background, and which page is your “Home” page (it can be a static Welcome page or show all of the most recent posts) . . . but all of these options can be customized later as well, so don’t worry about doing everything here now. Remember to click the “Save” before you click “Close” to change your Customization settings. Pages are typically static content that gives visitors more information on the site. Pages are different than posts in a few ways. Each page created gets a unique place on your site with a unique URL, whereas posts populate the same area of the site. An About page is a common static page on most sites. To add a new page: Pages > Add New. Fill in the title and body content. 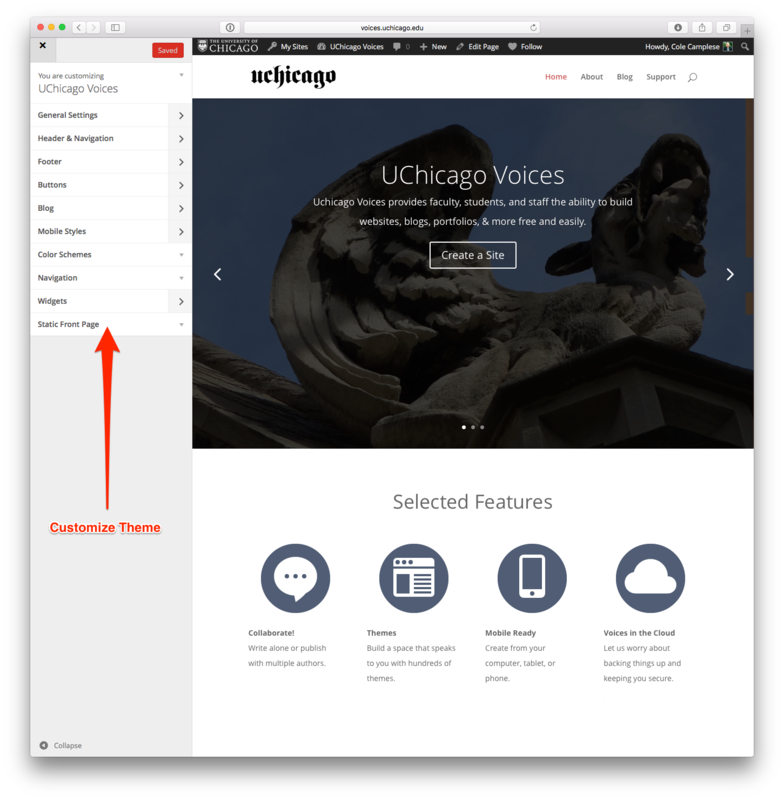 UChicago Voices makes it simple to publish just about any type of content to the web. Anyone can build a site. 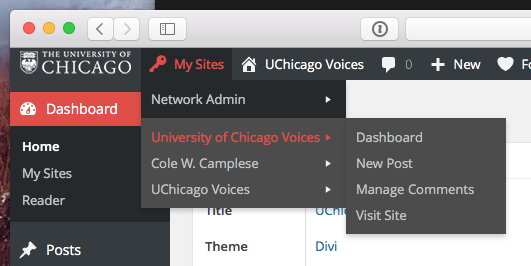 UChicago Voices is powered by WordPress and hosted by EduBlogs. UChicago Voices is a service provided by IT Services at the University of Chicago. At this time technical support is limited. IT Services does not monitor Web pages and does not assume responsibility for content. The authors of Web pages are responsible for the content of their pages. Use of this service is governed by University of Chicago policies and guidelines.